Chaos Theory: An adventure game is you! Location:Seattle area "I'll take a Double tall Mocha"
I grew up on adventure games before I even knew they were called "adventure games." One of my earliest memories of a friend's computer was playing Adventure. Following that, I was hooked. Maniac Mansion. King's Quest. Zork. Planetfall. Leisure Suit Larry. Space Quest. The Secret of Monkey Island. Sam and Max Hit the Road. Indiana Jones and the Fate of Atlantis. Myst. Gabriel Knight. Syberia. The Longest Journey. Back to the Future. The Walking Dead. I've never stopped loving the fun of exploring these worlds, "earning" the next page of the story, and finding out all of the bizarre ways I could die. However, at some point in the '90s, games journalists apparently decided that "adventure games were dead." It's something we started hearing a lot of, especially in comparison to all of the fancy new graphics, gameplay features, and fast-paced shooters. Adventure games were seen as a relic of a time when computers couldn't process heavy graphic loads and players were a lot more patient. I never bought into the "adventure games are dead" mindset. I see them coming back like crazy these days, especially on tablets and mobile devices. And lo and behold, Funcom did something that I would have never thought possible: The studio made an MMO out of an adventure game. 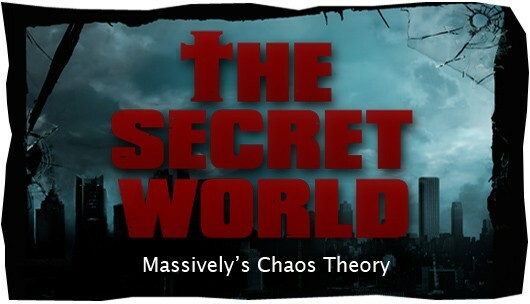 That's The Secret World, if you weren't following along. Continue reading Chaos Theory: An adventure game is you! Chaos Theory: An adventure game is you! originally appeared on Massively on Mon, 24 Jun 2013 11:00:00 EST. Please see our terms for use of feeds.